3. 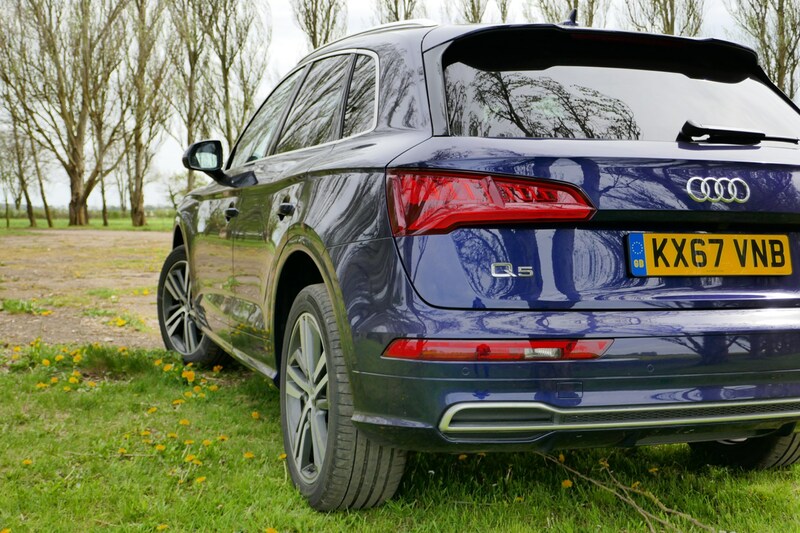 Is the Q5 good value for money? 7. Which engine is best? I’m going to kick off this series of long term reports with a confession. The first time I drove Audi’s second-generation Q5 (in top-of-the-range SQ5 spec, no less) I didn’t like it. Sure, it was quick - as it should be with 354hp and 500Nm of torque - and the cabin was lovely, but that was about it. There was none of the excitement you’d naturally want and expect from a £50,000 performance Audi. With that in mind, I was obviously the perfect candidate to take ownership of an Audi Q5 2.0 TDI Quattro 190PS S Line for the next five months. However, before anyone thinks that this is going to be a whitewash, I reckon I might actually like this version of Q5. Why? Well, with the 190hp 2.0-litre diesel engine, there’s no expectation of excitement attached. It’s just supposed to be a big, comfy, reasonably economical SUV to schlep around town and cruise down the motorway in. And, if memory serves me correctly, the Q5’s chassis is more than capable of providing the comfort part. So, now I’ve aired my initial reservations, it’s time to look at the latest addition to the Parkers long-term fleet in a little more detail. Sitting at the top of the trim level pile on regular Q5s is the ‘sporty’ S Line spec. I put the word ‘sporty’ in parentheses as, in reality, there’s nothing remotely sporty about it. However, that’s no bad thing and, when complemented with the S Line front and rear bumpers, side skirts, rear spoiler and diffuser, I reckon it’s rather handsome – as SUVs go. Standard kit includes a 7.0-inch infotainment screen with sat-nav, DAB radio, Apple CarPlay/Android Auto and Bluetooth phone connectivity. 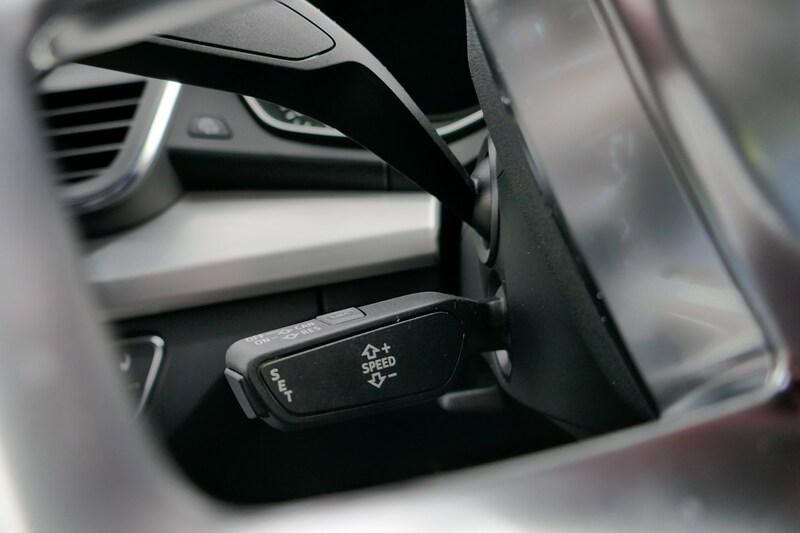 In addition to this, there’s other handy features such as cruise control, three-zone climate control, Xenon headlights, front and rear parking sensors, keyless ignition, drive modes autonomous emergency braking (in the form of Audi’s Pre-sense City safety system) and hill-descent control. *No longer available on UK cars. It’s a nice spec, but one thing that has already been bugging me is the absence of electric folding mirrors (they’re a £325 option and only come in combination with the electrically adjustable front seats). Granted, it might sound like I'm being fussy, but the Q5 has a sizeable pair of side mirrors that – ideally – you’d want to fold in whenever parked. Having to do this manually on a near-£50,000 SUV just doesn’t feel quite right. Life in the old diesel dog yet? Call me boring, but I still reckon the tried-and-trusted 190hp 2.0-litre TDI diesel engine is the best fit for a Q5 at this money. It’s quiet, has plenty of real world shove and should return at least 40mpg. We’ll be comparing it with the 252hp 2.0-litre TFSI petrol in due course, so keep an eye out to see if my opinions change. 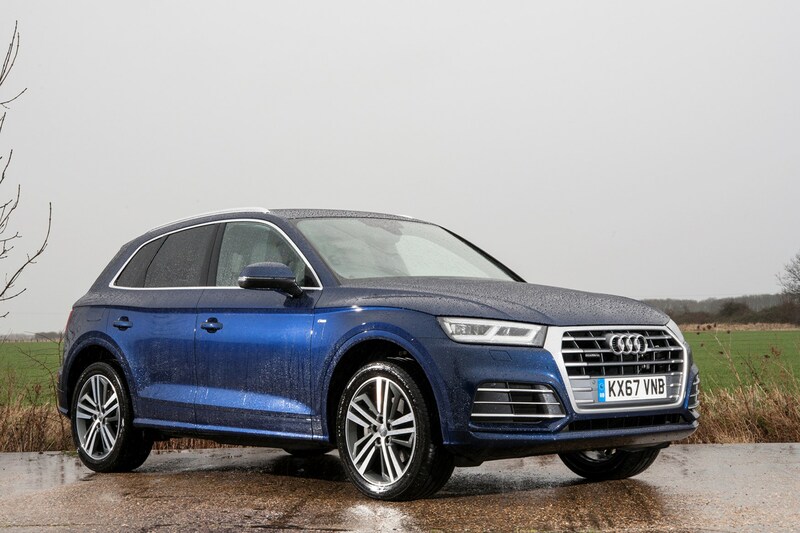 Is the Q5 the ultimate mid-sized premium SUV? If you’re after a high-end SUV but don’t want to upgrade to the full road-going tank like the Audi Q7, BMW X5 and Mercedes-Benz GLS, the Q5 should be an ideal fit. 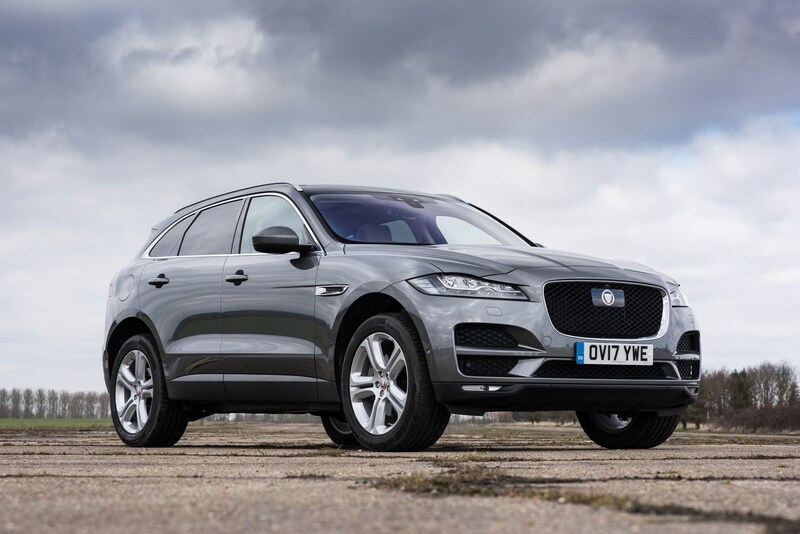 However, it’s positioned in an incredibly congested section of the market and can count heavyweights such as the Mercedes-Benz GLC, BMW X3 and Jaguar F-Pace as rivals. No mean feat to come out on top in this class; something I’ll make a judgement on towards the end of my time with the Q5. 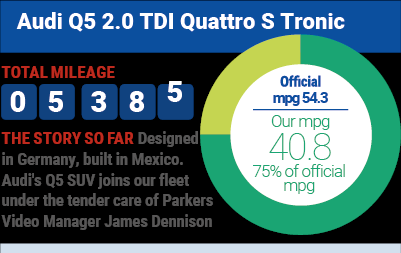 I’m now a few weeks into Q5 ‘ownership’, already clocking up a healthy 5,385 miles (it already had a couple of thousand on the clock) – many of which have been at the hands of grateful colleagues who’ve had long drives to undertake. So, first impressions? The first thing that struck me about the Q5 when I took home down the A1, was just how quiet its 2.0-litre TDI diesel engine is. And I don’t just mean at a cruise, either. Unlike many diesel-powered cars, it maintains its refinement at low speeds, too, meaning the engine never feels intrusive or clattery when puttering around town. Excellent. Complementing this is a ride which – although not quite pillowy soft – is supple, and comfortable on a long journey. I’ll look to compare the – now discontinued – adaptive comfort suspension on my car with the optional air suspension in the coming months. 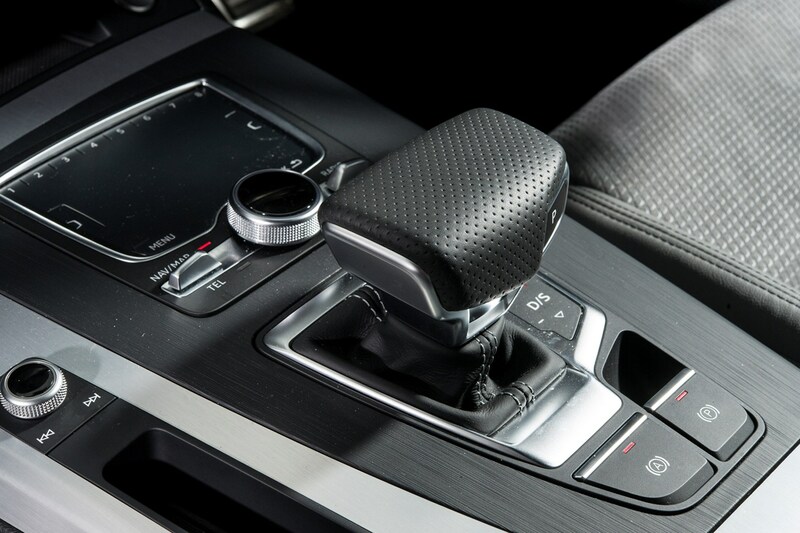 The Q5 comes with six different drive modes (Efficiency, Off-road, Auto, Comfort, Dynamic and Individual), and I started off simply leaving it in Comfort. However, I couldn’t help but notice that this setting made the steering feel a little on the light side when driving on motorways, prompting me to feel like I had to make constant adjustments to keep the car’s line straight. 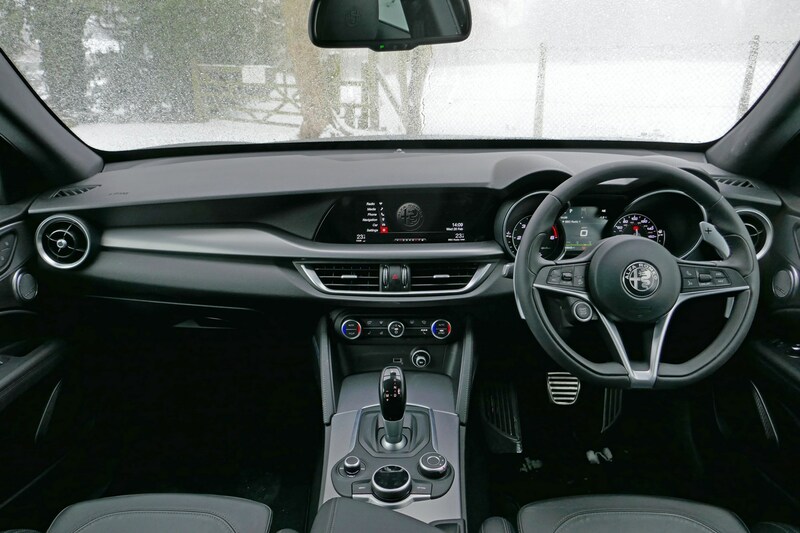 A quick delve into the car’s infotainment system, however, allowed me to tweak the Individual mode for comfort suspension, auto engine and dynamic steering settings, the latter giving the steering wheel a greater heft for driving at speed. I also set the shortcut button on the wheel to toggle drive modes (the drive mode selector switch is placed awkwardly on the wrong side of the cabin), allowing me to switch back to Comfort mode (and the associated light steering) for driving in town. Due to a spate of bad press going back the past few years now, diesel car sales are falling – and this is a real shame. Especially if you’re in the market for an SUV. 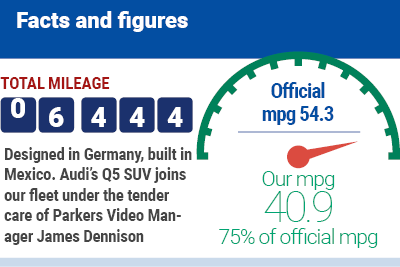 Because the fact is, if you need to run a large car – like the Q5 – diesel engines provide the best fuel economy. Sure, the all-electric Tesla Model X SUV can do 350-odd miles of range without using a drop of fuel, but not everyone wants an electric car – let alone one that costs well over £100,000. And, yes, you could buy a regular petrol SUV, but only if you’re prepared to watch the fuel needle on your car drop like a molten potato. And with the current crop of hybrid SUVs few and far between, you’re left with the good old-fashioned TDI. The one in the Q5 is currently reading a touch over 50mpg on my 100-mile trips to work and back, although I’ve no doubt the actual lifetime average will come in a few points lower. Are the electric-folding mirrors broken? 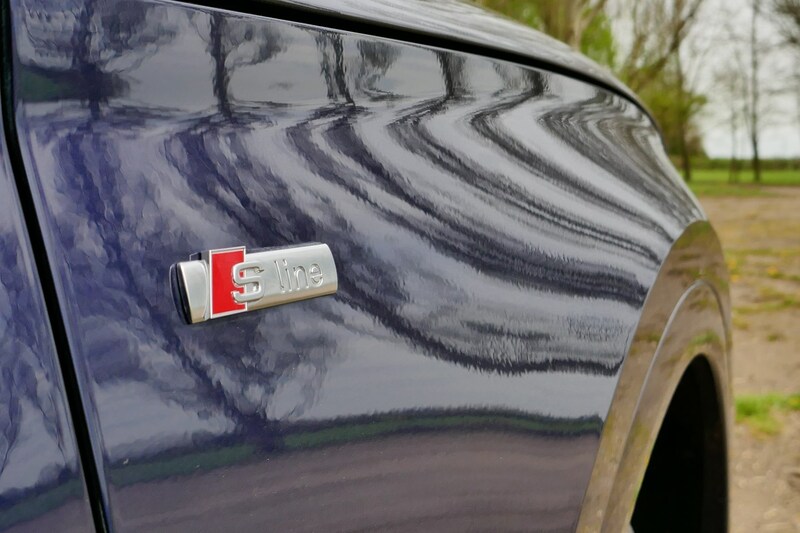 No, the Q5 simply does not have them (as standard, at least) Forgive me for sounding like a prima donna, but surely electric folding door mirrors should be standard-fit on a £47,000 Audi SUV, no? They’re understandably large (in order to provide a good view of what’s behind the car), so do really need to be folded in. Doing so manually just quick click with what is otherwise a very cossetting and luxurious premium SUV. If you do want the folding door mirrors, they’re a £225 optional extra. Update 3: Is the Q5 good value on finance? 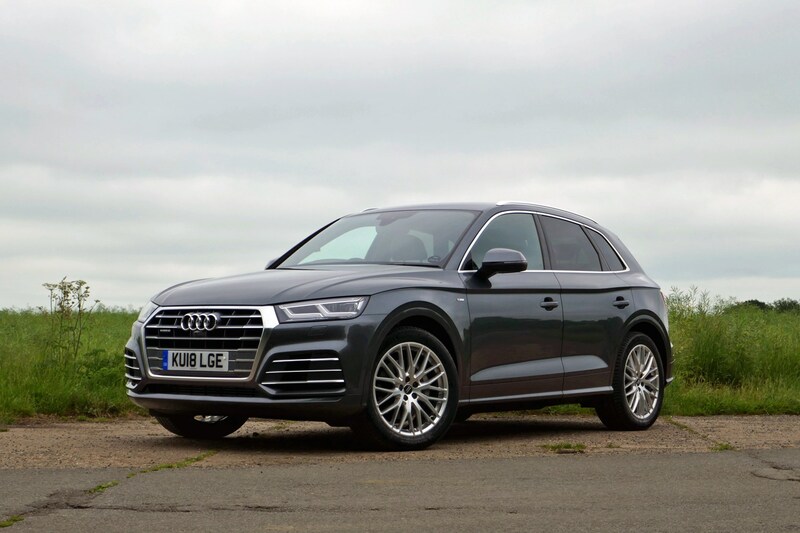 My Audi Q5 long-termer’s list price comes in a little south of £50,000, and, unless your occupation is oligarch – that’s rather a lot to stomach. However, fewer than 20% of UK car buyers pay cash upfront for their treasured automobiles, instead relying on the many and varied finance deals to get them behind the wheel. And when it comes to finance, list price only means so much. For example, you could have a £40,000 car that offers poor finance deals, costing more per month than a £50,000 car with good finance deals. The optional final payment at the end may well even things up, but the majority of people choose to hand the car back anyway – thus dodging the balloon payment. 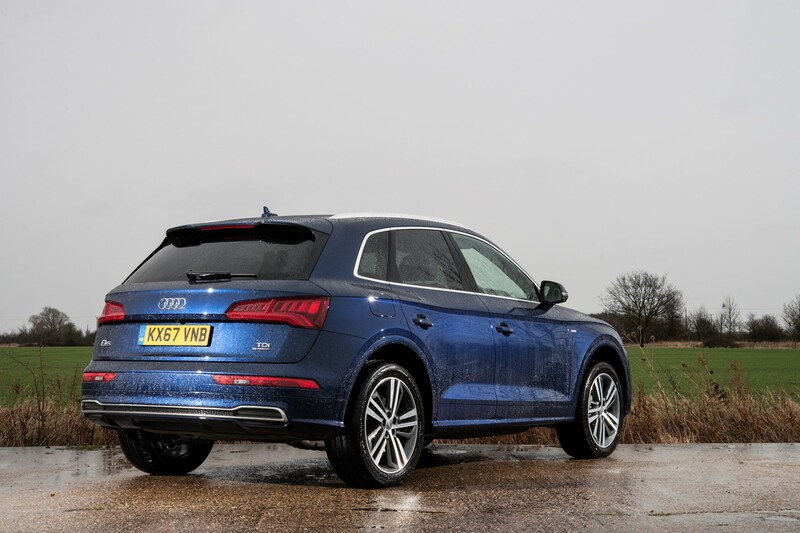 With this in mind, how does my Audi Q5 long-termer fare in the field of finance? To find out, I’ve fished out some quotes from its biggest rivals – all of which are on a 48-month contract with a £7,999 deposit, based on 10,000 miles per annum. Plugging our Audi Q5 S Line 2.0-litre TDI Quattro S Tronic into the manufacturer’s finance calculator brings up a monthly payment of £384, with an optional final payment of £21,520. APR is 6.4%. 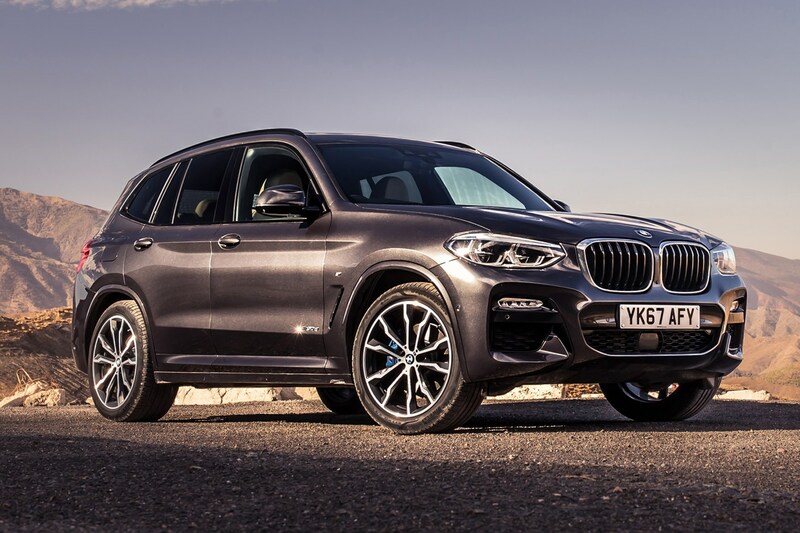 BMW’s X3 SUV is around the same size as the Q5, and comes with a range of petrol and diesel engines including a 190hp 2.0-litre diesel with xDrive. Team it with M Sport trim and you’ll be paying a pricey £454 a month (at 5.9% APR), although the optional final payment is considerably less than the Audi’s at £19,116. Mercedes-Benz’s GLC 250d 4Matic AMG Line goes one better than then X3, and beats the Q5 for monthly payments and optional final payment. The former comes in at £378, while the latter is £17,325 – representing a £4,195 saving over the Q5. APR is 5.9%. It's been around for a few years now, but the Range Rover Evoque is still a hugely popular SUV thanks to its stylish looks, strong drive and excellent badge kudos. How does it fare on finance? Well, on a 5.9% APR contract you can get an HSE Dynamic 2.0 Litre TD4 Diesel Automatic (180HP) (4WD) for £401 per month with an optional final payment of £20,578. If you’re after something a little different to the German regulars, then Jaguar’s F-Pace SUV is well worth considering. Like the BMW, the F-Pace 20d AWD Ingenium version commands a pricey monthly fee (£440) but still undercuts the Q5’s optional final payment by £3,700. Again, APR is 5.9%. 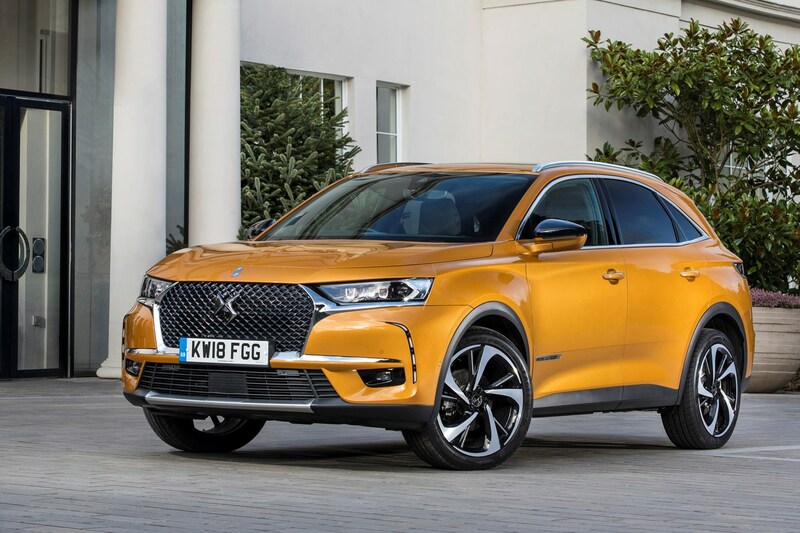 Finally, if you want to go really left-field (and save a bit of money), then the DS 7 Crossback could be the car for you. Opt for a Performance Line 2.0 BlueHDi 180hp EAT8 model, and the monthly payments (on the basis of 4.9% APR) work out at £362, while the optional final payment is £14,235. It’s a fairly simple one, really. If you plan to keep the car at the end of the deal, the Q5 isn’t as good value as its rivals thanks to a chunky final payment. 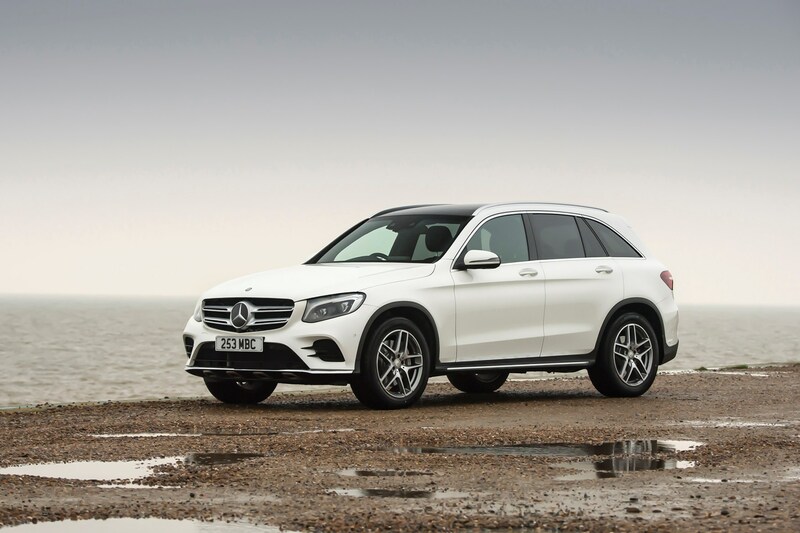 However, should you be happy to return the car after three years, only the Mercedes-Benz GLC (among the Q5’s three main rivals) is (very slightly) cheaper. Disaster. ‘My’ Q5 has been violated by the local car wash. Now, I’m not going to start naming guilty parties, but needless to say I’m not thrilled. After all, it was nearly spotless before that ill-fated trip down to the cleaners. How did all this happen? The full sob story continues below. Dirty car or damaged bonnet? 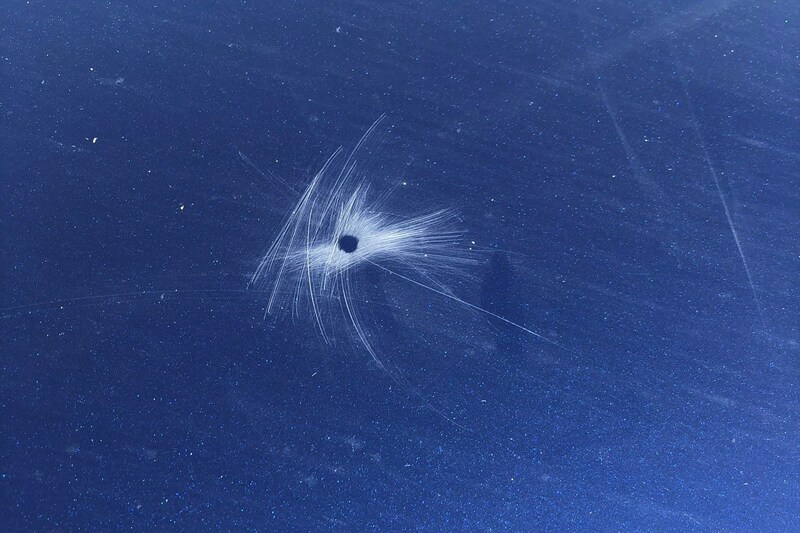 Some cars just seem to attract the attentions of incontinent birds. A friend’s Volkswagen Scirocco was terrible for it. 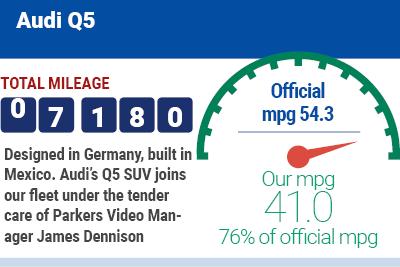 But the Q5 – different league. No matter where it’s parked – even in underground car parks – it’s just a horrendous bird magnet. Anyhow. After another weekend of the Q5 being used as a mobile cess pit, a colleague took it down to the unofficial Parkers car wash. The car was cleaned, hoovered and waxed ready for the next soiling session. However, before such an event could occur, I happened to clock a couple of small – actually rather large – scratch marks that certainly hadn’t been there the week before. Where had they come from? The picture above gives it away. Clearly, the hardened bird dirt had been proving tricky to scrub off. So tricky, in fact, that one of the cleaners had managed to get shards of said excrement into their cloth and then continued to scrub away at the paintwork, damaging all but the area protected by the most hardened faeces. The end result? Well, the pictures tell the full story, although, in fairness, they do make the marks look worse than they really were. Noticeable – yes. Catastrophic – not quite. However, they were enough for Audi to want to take its car out of the firing line for a week, meaning the Q5 had to head back to HQ. 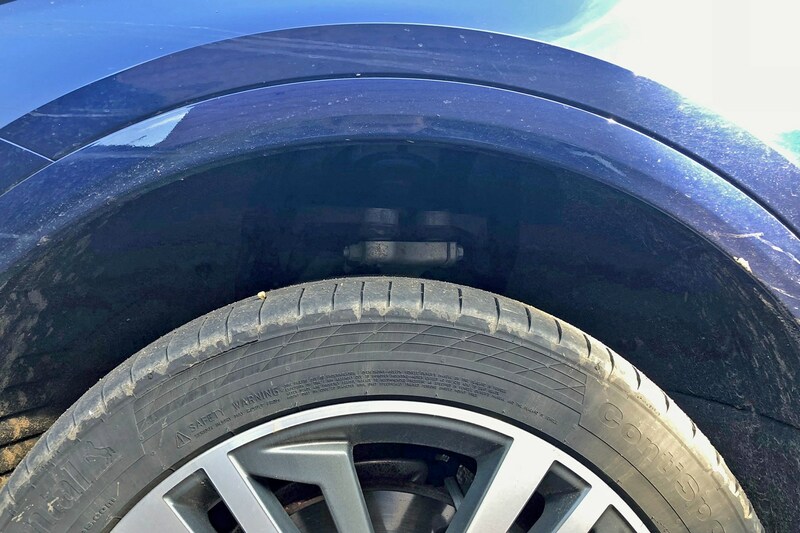 During its automotive equivalent to a spa break, the Q5 was given a full valet (without any scratches) and a new set of front tyres (the original ones were apparently on the legal limit – oops!). What to take away from this experience? Well, birds love the Q5. And car washes – even hand-operated ones – can’t be trusted. Make sure you watch their every move, folks. But it sits in the office car park, between long runs, not attracting attention, just getting on with the job. That's what I think, anyway. I'm not sure the rest of the Parkers team agrees with me, though – because it's actually quite a difficult car to get into. It's a popular choice with everyone, I guess for all the above reasons. 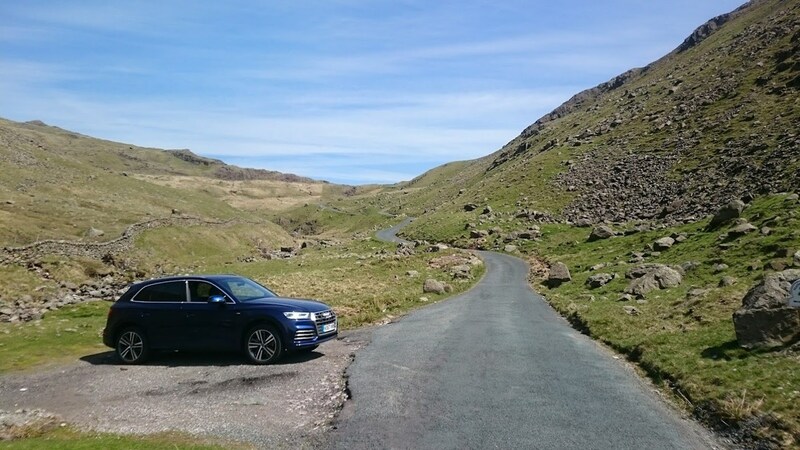 I used the Audi Q5 for three trips up to the Lake District, and this was the perfect opportunity to really get to know this car. 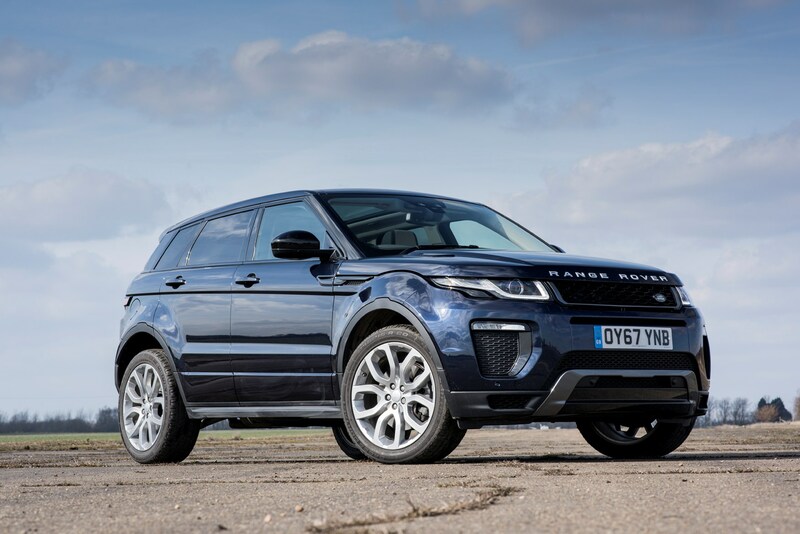 The interesting thing for me is how it compares with my regular long-term test car, a Range Rover Evoque – they both arrived at the same time, they're both reasonably powerful diesel versions, and they're both, er, blue. 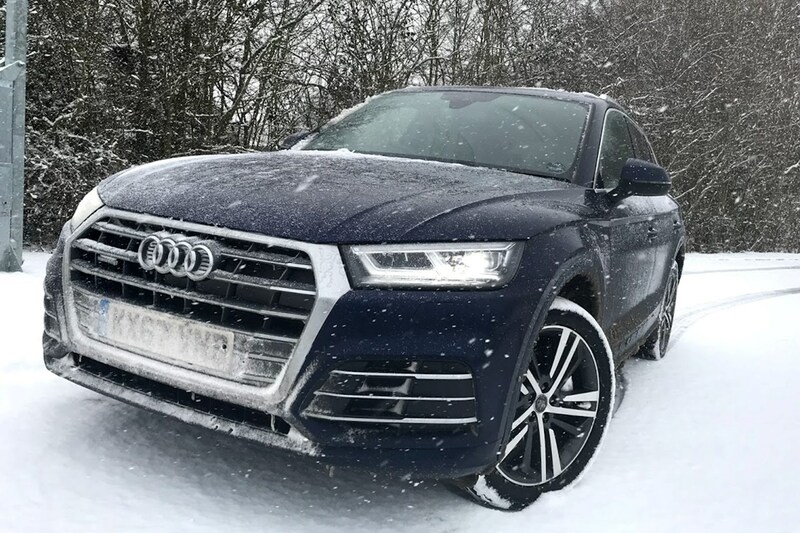 My first long trip in the Q5 coincided with the Siberian snow storms that swept across the UK. I'd flown in to Newcastle Airport from a job in Prague, where the temperature had been around -10 degrees. As I walked out of the airport and towards my car, I couldn't ignore the light dusting of snow. Ah well, a good test for the Q5, I thought at the time. 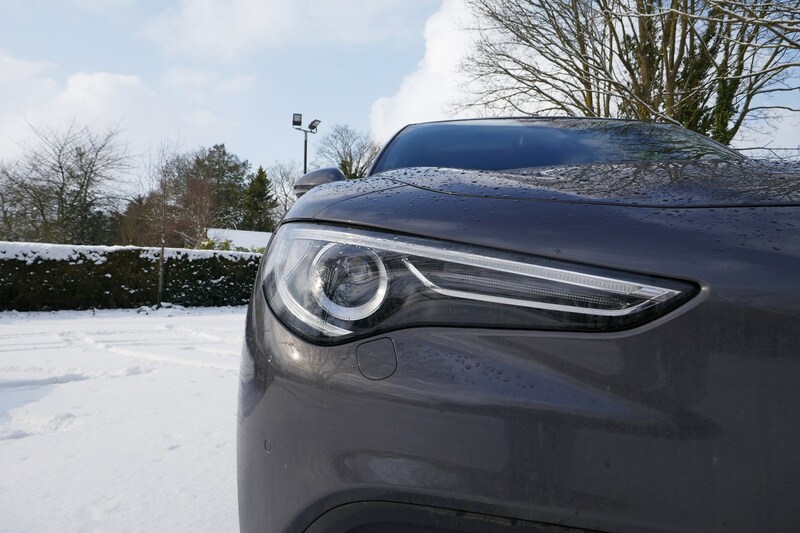 Hitting the A1 and heading south, it soon became apparent that this light dusting of snow was altogether more serious – it was a proper white-out, and cars all around me ground to a halt, the Q5 picked its way through, never feeling anything other than assured. The traffic was terrible, with anything like a hill choked up with cars at a standstill. I'd have been stuck in it too, had I ignored the sat-nav, which advised of the worse queues ahead. By the time I'd got home, I'd ploughed through a snowed-in Stamford at 2.00am, literally the only vehicle moving in the carnage. Over the following days, the Q5 never put a foot wrong. Yes, it may lack the ultimate off-road ability of a well-sorted Land Rover, but there's no denying that the Quattro system works a treat in deep snow. And what about more normal driving? There's a lot to like about the Audi Q5. It's assured on the motorway, quiet, refined and reasonably economical. Compared with my Evoque, its average of 40+mpg is really rather good, and its overall engine refinement is leagues ahead, too. Where the Q5 does fall down, though, is that although its solid and functional inside, it's a rather dour place to spend time. The grey and black plastic is hardly inspiring, and the seats are hard as church pews, and end up giving me backache after about 150 miles. Things I like about the Q5 easily outweight its short list of faults. Its virtual cockpit is brilliant to use, and the interior quality and built is an obect lesson for everyone else. As for how how exciting of soul-stirring it isn't – that doesn't matter as this pales into insignificance compared with its no-nonsense ability to just get the job done. No wonder I can't actually remember too many of the 1,500 miles I've done in it. And why it's so popular with the rest of the team. One of the most common questions I get asked about the Q5 is what spec I’d go for and what optional extras I’d recommend. Happily, there’s a simple answer to the former. Top spec S-Line is the most the most sought-after trim and there’s a reason for its popularity. The upshot of this is a car that not only looks smarter in the eyes of many buyers, it also holds off depreciation better, too, meaning your car is worth more when it comes to selling. 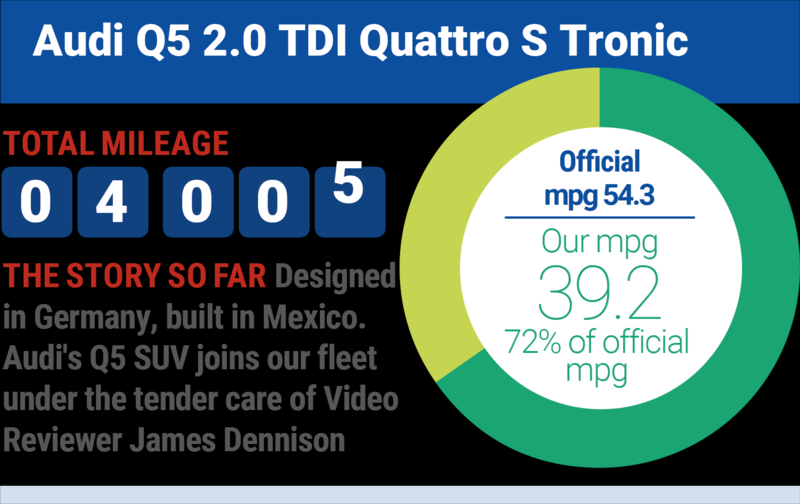 Which options does our Q5 have? Maybe – They look great and don’t harm the ride quality too badly when paired with adaptive dampers or air suspension. Not essential, though. Essential – Mega useful to have the extra range, plus it’s free. What’s not to like? Essential – Same as above. Maybe – Adds a number of handy storage extras such as a lockable glove compartment, nets on the back of the front seats and a cupholder in the rear centre armrest. Maybe – Adds a touch of softly lit class to the interior with multi-coloured ambient lighting. Far from essential, however. Essential – Includes a rear-view camera, keyless entry and the superb Bang & Olufsen sound system. Essential – Includes a larger 8.3-inch infotainment screen, yet the most important addition is Audi’s superb Virtual Cockpit system. N/A – No longer offered on UK cars. Essential – For such a comparatively small outlay, it’s worth it. Maybe – Looks nice in the sun, and when clean. Audi Q5 accessories ­– which are worth their weight in gold? So, with this in mind, what other goodies need their option box ticking on that order form? 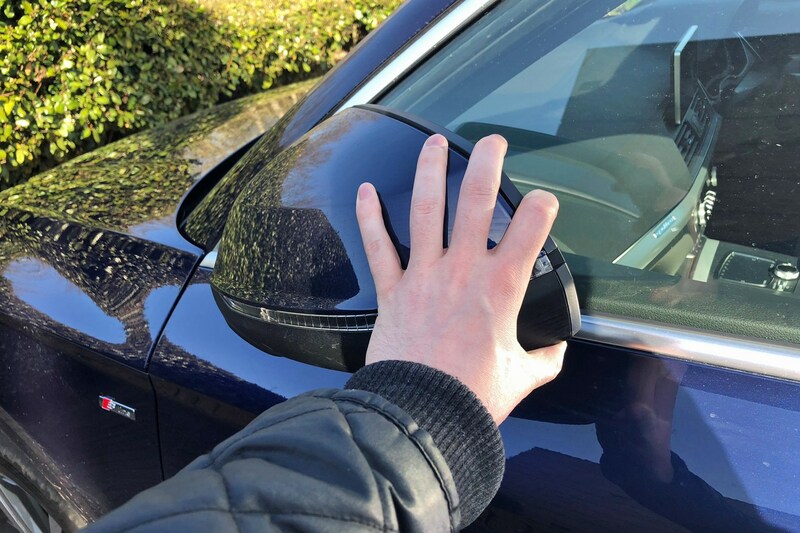 The first that comes to mind – and regular readers of this page will likely be bored of me going on about this now – are electrically folding mirrors. 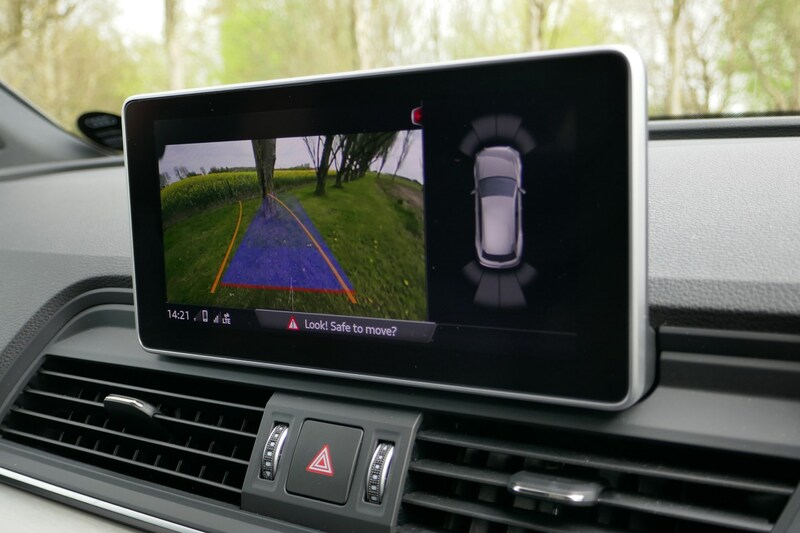 Available for £225 (or £325 if you want them auto dimming with memory function) they save you having to fold the Q5’s sizeable mirrors in manually when parking on a busy or narrow road. And let’s face it, electrically folding mirrors should be standard on a premium Audi SUV right? In the absence of adaptive dampers, I’d also strongly recommend the air suspension that I’ve tried on a couple of Q5 variants to be featured in a later update. 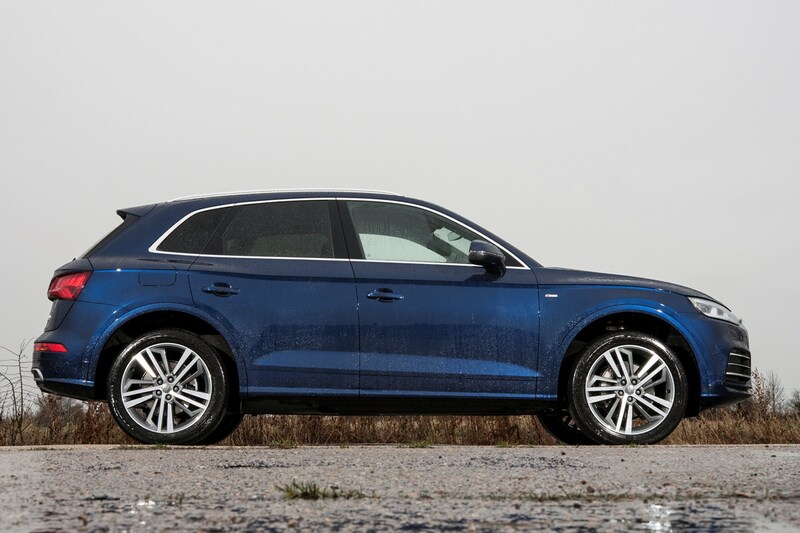 Pricey but effective, the £2,000 option adds an even greater degree of composure to the Q5’s ride and helps cement its status as a formidable mile-muncher. The Tour pack is another worth considering if you’ve got an extra chunk of cash to spend, coming in at £1,250. It offers a vast array of extra kit, including adaptive cruise control (with the anti-mind-numbing Traffic-jam assist), traffic sign recognition, active lane assist and extending the autonomous emergency braking’s effective range to the vehicle’s entire speed range ­­– instead of the standard 52mph approximate limit. Finally, the panoramic glass sunroof – at £1,400 – helps brighten up the cabin nicely, especially if you have a dark leather interior, and should keep the kids entertained in the back. Spec sorted, which is the best engine to have in your Q5? For the Parkers Expert opinion, be sure to tune in next week where we pit petrol against diesel in our Q5 engine face-off. 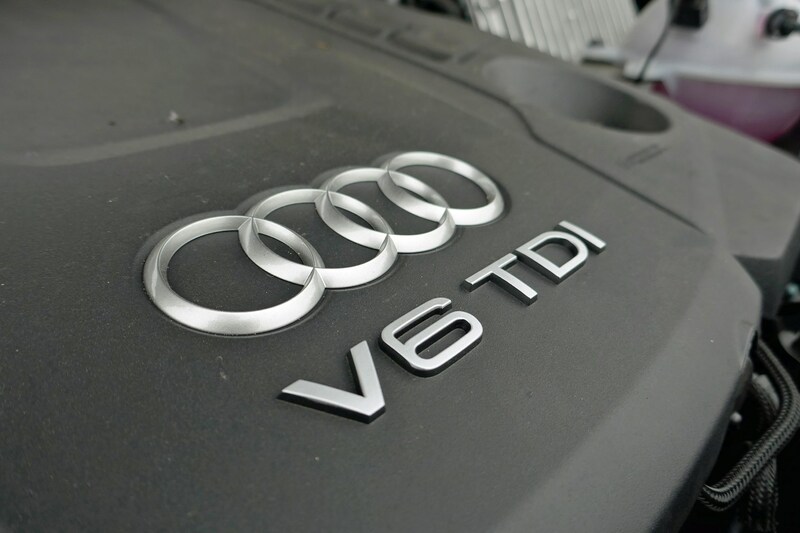 Update 7: Which Audi Q5 engine is best? 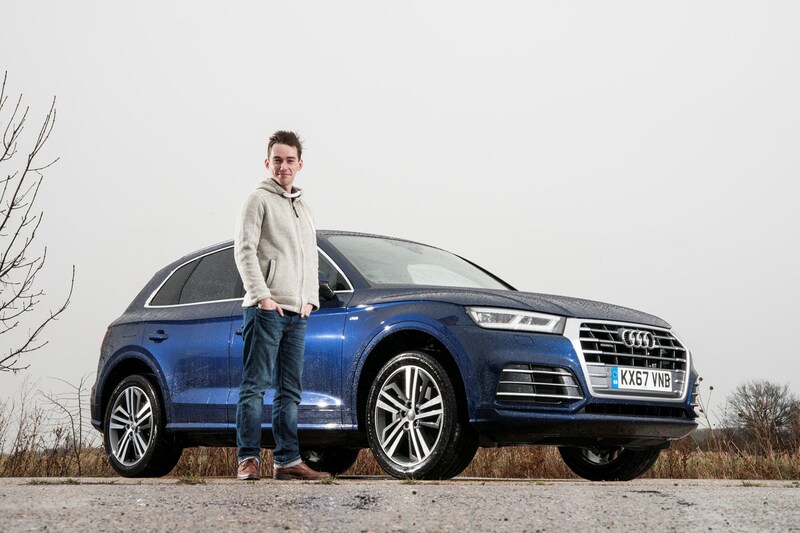 2.0-litre TFSI, 2.0-litre TDI or 3.0-litre TDI – which one does Audi Q5 guardian James Dennison prefer? Last time out, I ran through the must haves and must avoids of the Audi Q5 options list, so it’s only logical that we should now discuss engine choices. There’s three on offer in the Q5 – a 245hp 2.0-litre TFSI petrol, a 286hp 3.0-litre TDI diesel and, the one that’s fitted in my long-termer, a 190hp 2.0-litre TDI. All come with Quattro all-wheel drive and either a seven-speed S Tronic or eight-speed Tiptronic automatic gearbox as standard. I really wasn’t expecting to like this engine. 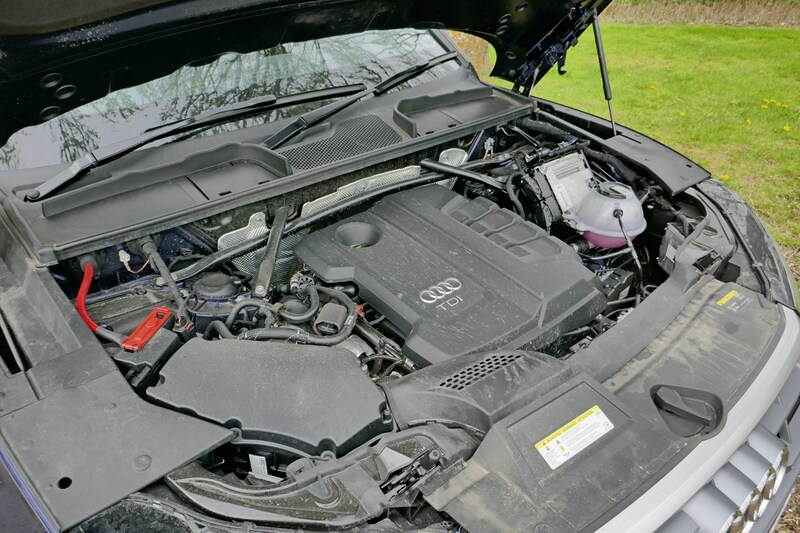 I’d always thought SUVs should have torquey diesels under the bonnet to pull their considerable heft along, but the 370Nm of torque in the 2.0-litre TFSI does just fine. More than fine actually. It’s got a surprising amount of grunt from low revs and once it gets into its stride, propels the Q5 along with genuine alacrity. Needless to say, it’s the quietest of the three engines, too, and has the silkiest, smoothest power delivery you could realistically hope for. Real world fuel economy is mid to late 30s – not bad considering. Obviously, this is the engine I’m most familiar with, yet in the five months I’ve had the Q5 contempt hath yet to be bred. It’s smooth, quick-enough and seriously refined (far more so than engines on rival models) plus can do 600 miles on a single tank of diesel. I’m struggling to fault it. Had you given me a choice of engine in the Q5 before I took delivery, the 3.0-litre TDI would have been at the top of my list. Brawny, economical and with a 5.8-second 0-62mph time, it looks the ideal combination on paper. Yet the reality proved anything but. 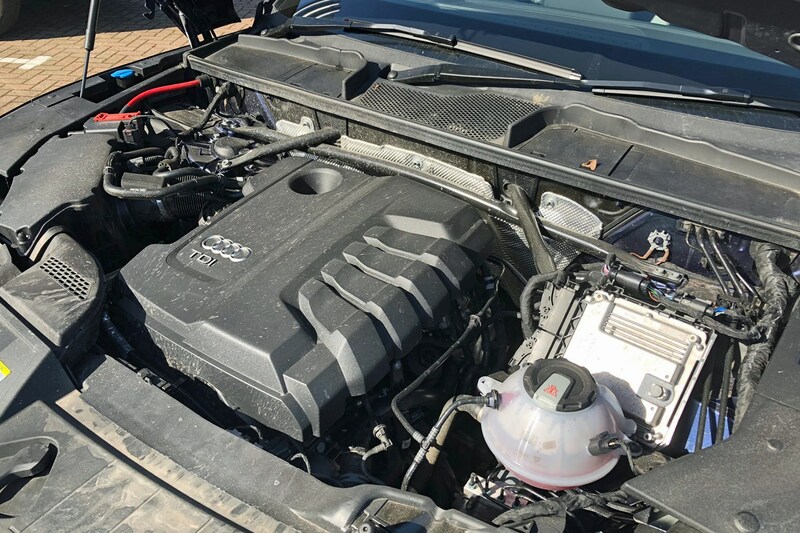 It wasn’t that it was a bad engine and, yes, maybe I was expecting too much, but it never gelled with me – or the rest of the car for that matter. 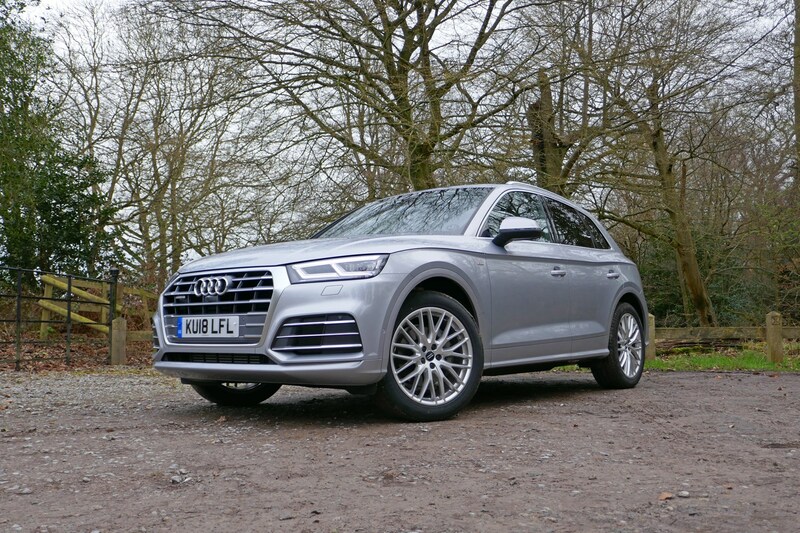 Understandably, the Q5 felt heavier – especially over the front wheels – adding an extra layer of lethargy to the handling that I’d not experienced in the 2.0-litre versions. Also, the refinement seemed to not only be inferior to the 2.0-litre TDI, but also to other Audi models I’d driven with the same 3.0-litre engine. Odd. And while it was very quick, it just felt unnecessary – and together with the downgraded handling (thanks to the extra weight) – you’d struggle to enjoy the extra pace in anything other than an arrow straight line. This engine was just a joy to use. Quiet, quick and more economical than you’d expect. Who says petrol power doesn’t work in SUVs. It’s the slowest of the three engines, but for once that really doesn’t matter. Plenty fast enough and with excellent refinement to match, its 600-mile range is outstanding for an SUV of this size. Heavy, noisier and less economical than the 2.0-litre TDI, the 3.0-litre TDI engine struggles to make sense. 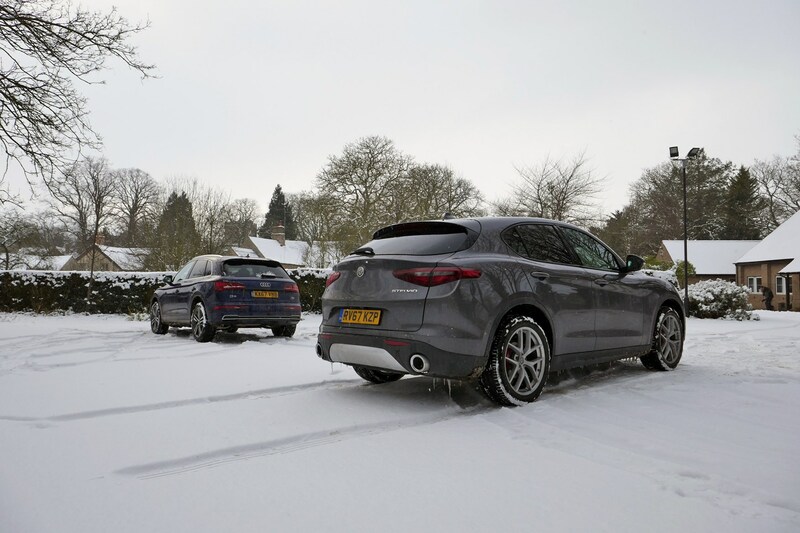 Can Alfa Romeo's first ever SUV match up to the Parkers Audi Q5 long-termer? I’m not far off waving goodbye to ‘my’ Audi Q5 and to say I’m ruing the day it goes, is, well, about right actually. See, while I can appreciate the Q5's talents, I don’t spend every waking moment fantasising about driving it. And while this might seem perfectly normal, I have had previous long-termers (SEAT Leon ST Cupra and Mazda MX-5) that I’ve gone out of my way to get behind the wheel. So, my question this week is this: is there anything out there that does all of the sensible Q5 bits (excellent cruiser, practical, well-built, nice cabin etc) but has a little more sparkle about it? Well, I think I may have found the answer in Alfa Romeo’s Stelvio. It’s the first SUV that the famous Italian marque has ever made and by the accounts I’ve heard so far, it’s a pretty good effort. But, is it a match for the Q5 and does it have the necessary charm to make me want to drive it more than said Audi? Let’s start with the handling. While the Q5 specialises in predictable, stable handling with slow(ish) steering and noticeable bodyroll (where the body of the car leans on the chassis through corners), the Stelvio (in 2.2-litre turbodiesel 210hp Q4 AWD form) is by far the more agile machine. Weight is down on the Q5 (1,604kg vs 1,770kg) and it shows in the bends, with the Alfa Romeo proving keener to turn in and displaying noticeably less bodyroll. Even with the optional Q4 all-wheel drive system fitted, the Stelvio still feels like a rear-wheel drive sports car on – fairly short – stilts, pushing the rear end out if you’re heavy on the throttle through corners. Part of the extra agility is brought about via the super sharp steering (that will take some getting used to), but it quickly becomes clear the Stelvio has more about it dynamically than the Q5. Sure, the Audi is brilliantly stable, but the sense of involvement you so rarely get in an SUV is absent. Alfa 1, Audi 0. 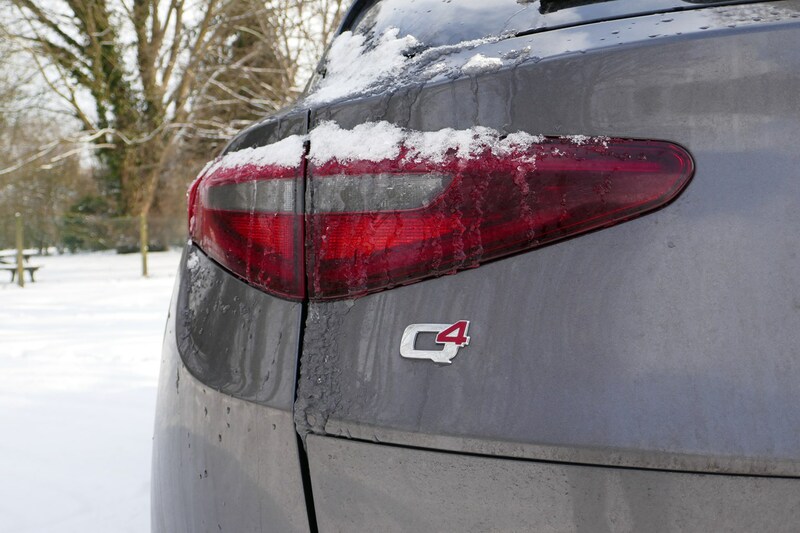 Driving the Q5 around at low speeds shows off one of its strongest features – engine refinement. Once warmed up, the 190hp 2.0-litre diesel is remarkably quiet and refined (more so than the 3.0-litre TDI). The Stelvio on the other hand, isn’t quite so tranquil. There’s noticeable diesel clatter from the 210hp 2.2-litre four-cylinder turbodiesel engine and it feels borderline rough at low speeds. Things do quieten down when you get going, but still not to the degree of the Audi. On the other hand, however, the Stelvio has more ‘get-up-and-go’ to the way it accelerates. Where the Q5 is smooth and gradual, the Alfa leaps forward with fervour and doesn’t feel held back by a hefty kerbweight. 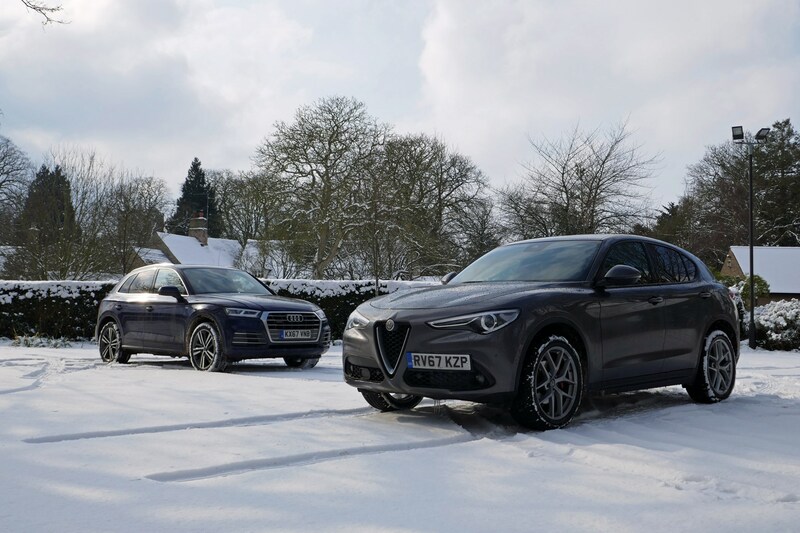 Acceleration times to 62mph are nearly identical (7.6 seconds for the Alfa Romeo and 7.9 for the Audi), mind, so don’t expect the Stelvio to go steaming off into the distance in the real world. This is where things begin to unravel for the Alfa Romeo. 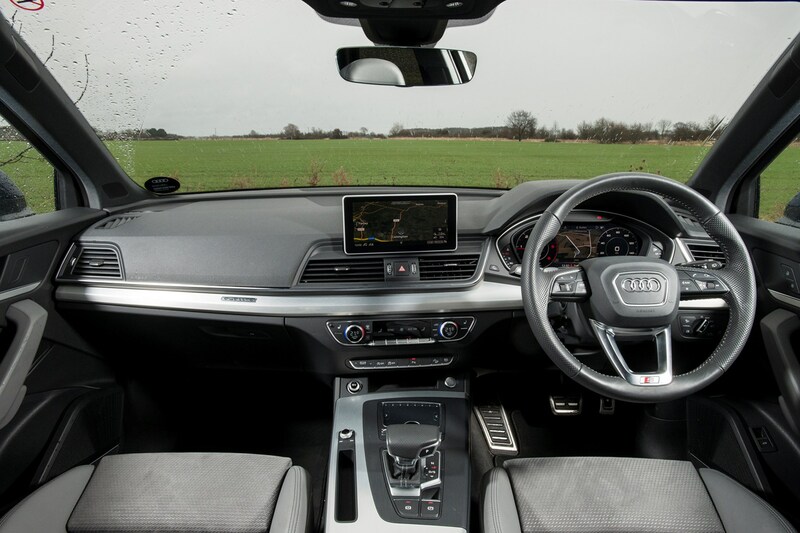 The Audi’s interior is an exercise in excellent quality, a slick infotainment system and logical design. Sadly, the Stelvio’s is the opposite. 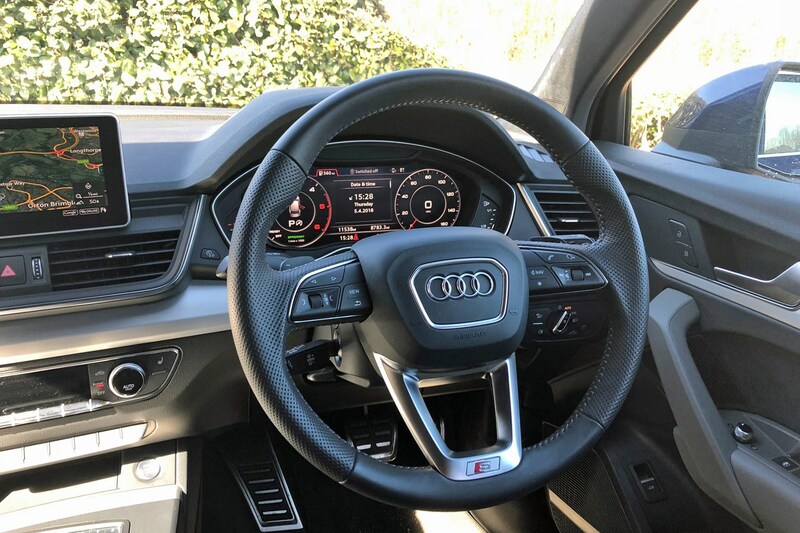 In fairness, there’s little wrong with the layout – it’s different to the Audi but not necessarily inferior (plus, the optional metal gearshift paddles behind the steering wheel are superb). No, the problem comes mainly from the material quality and infotainment system. Although the leather seats look good and feel plush, the rest of the cabin is peppered with too many pieces of cheap plastic and ugly looking materials. The gearlever, for example, has a sharp edge where the plastic cover sits – far from ideal on a control you use frequently. What’s more, the dial for the infotainment system (thankfully it’s not a touchscreen) also feels low rent and doesn’t have the same satisfying weight as the Audi’s. And then, once you start using said infotainment, the clarity, speed and intuitiveness are disappointing. We know that the Stelvio isn’t perfect, but does it have enough Italian charm to tempt me away from the more capable Q5? In a word, no. Despite its impressive handling, performance and distinctive looks, there’s just not enough about it to convince me to drop the Q5 for the quirky alternative. The compromise is too great. 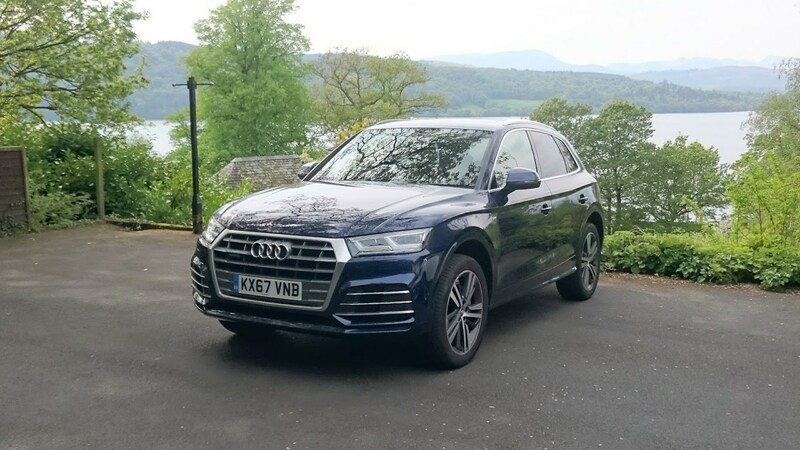 The Q5’s penultimate report update is due, and instead of have me harp on about how downright excellent it’s been, I’ve bothered other members of the Parkers team for their opinions on Audi’s large SUV. Do they like it as much as I do? Read on for their thoughts. 'It's fair to say James's Q5 wasn't usually top of my list of cars to take home (usually because I couldn't wrestle the keys from his grasp) but every time I drove it, I wondered why I didn't do it more often. It's an seriously accomplished cruiser that slots inoffensively into your life, and quietly gets on with the business of getting you home in as unflustered a state as possible. The 2.0-litre 190hp diesel engine feels strong enough, enabling you to stride down the motorway with confidence, while remaining lighter over the front wheels than the V6 option we tried. While not the last word in driver involvement the Q5 could be a good laugh on the right road, with trademark neck-straining mid-corner grip-levels afforded by Audi's Quattro all-wheel drive available by the bucket load. Best of all though is the cut-and-paste interior we've enjoyed in everything from this car to an A4 Avant, RS 5 and beyond. The fact it's not unique matters little - high-quality materials and tight panel gaps that'd impress the Giza Pyramid's project manager make this one of the most impressive cabins available. Yes, rivals like the Mercedes-Benz GLC and Alfa Romeo Stelvio are swoopier and more expressive in terms of design but you don't want that, do you? You want an interior that looks like that eye-wateringly expensive coffee machine you saw in John Lewis once. All black and brushed aluminium with illuminated switches and buttons. Imagine inviting your neighbours round for dinner and then casually offering them a post-dessert coffee from that. Have a go at making an espresso yourself, you say, it's so intuitive and satisfying to use. Ooh they'd say. That's what you want. Well, that’s it. Over 15,000 miles and a little over five months in the Audi Q5 and our time together has come to an end. It’s faced trial by bird faeces, trial by Parkers Editor and trial by new, quirky Alfa Romeo rival, and, aside from the animal dirt, test it’s come out with flying colours. During my time with the Q5, I drove every other engine that Audi allowed you to spec with it and concluded that you could do far worse than opt for the basic 190hp 2.0-litre diesel. Why? It’s smooth, quiet, quick enough and returns excellent fuel economy for such a big old beast – a calculated 41.6mpg average at the end of my time with it. Meanwhile, if you can stretch to it, the 2.0-litre TFSI petrol is superb and provided far more flexibility and fuel economy than I expected from a relatively small petrol engine in an SUV. No surprises, here, the S Line trim is excellent. It provides greater visual impact than the Sport trim, and should hold its value better, too. That said, I’d still recommend a healthy smattering of optional extras to bring the Q5 up to scratch. The 70-litre fuel tank is an essential no-cost option, as is the 24-litre AdBlue tank. 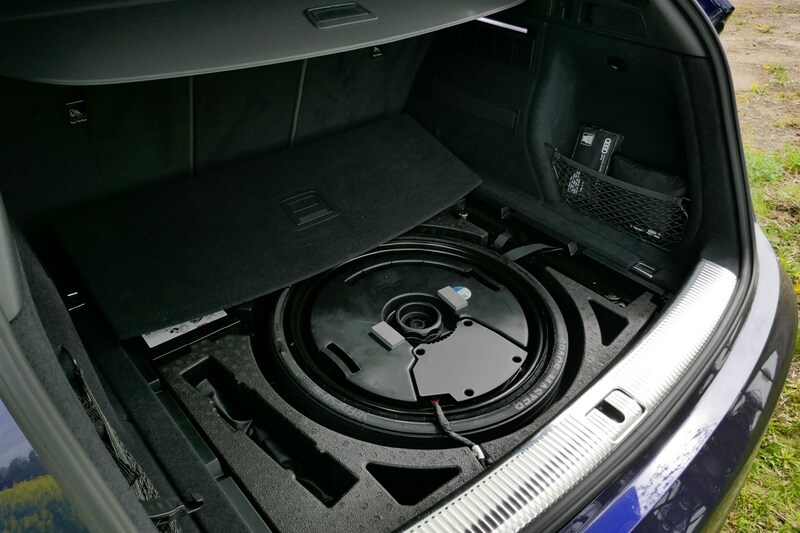 Meanwhile, the Comfort and Sound Pack (featuring keyless entry, a rear-view camera and the superb Bang & Olufsen sound system), Technology Pack (including a larger 8.3-inch infotainment screen, and Audi’s superb Virtual Cockpit system) and collapsible spare wheel are other recommended options. Adaptive comfort suspension with damping control is also a worthwhile upgrade and I enjoyed the extra cushioning it gave the Q5 on 20-inch wheels. However, since I took delivery of the Q5 this particular option has been discontinued. Therefore, it’s either the standard springs or the air-suspension, which, incidentally, is even better than the adaptive comfort setup. 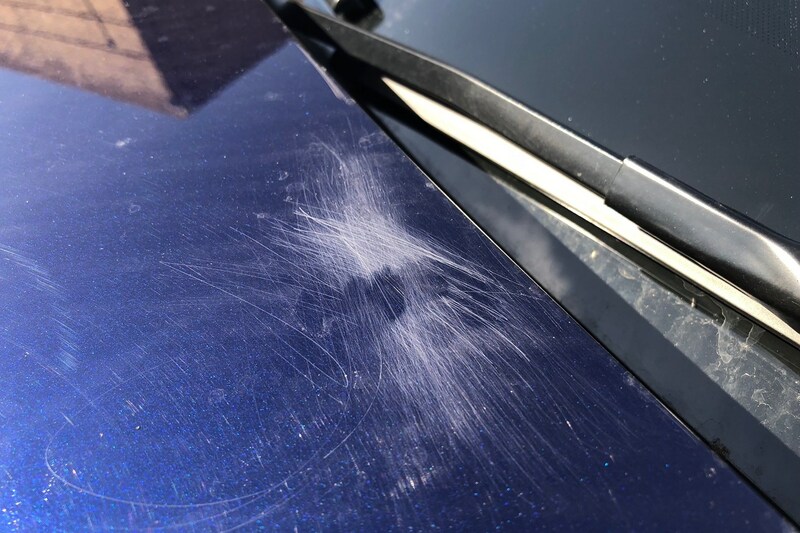 It goes without saying, but do be careful about how your car is washed ­– especially if it has hardened bird dirt baked onto the pristine Navarra Blue metallic paint. See, if you scrub at it with a sponge, and small particles disintegrate into said sponge, you end up with the equivalent of sandpaper massaging the surface of your precious paint. The outcome? The picture tells a thousand words. Update 3 saw me pit the Q5 against its rivals for an episode of SUV finance wars. Up against the BMW X3, Mercedes-Benz GLC, Range Rover Evoque, Jaguar F-Pace and DS 7 Crossback , the Q5 came out in second place just behind the GLC ­– provided you hand the car back at the end of the three-year contract. The Audi Q5 has been a fantastic servant over the past five months. It may not have set the pulse alight, but as a tool for simply getting from A to B in excellent comfort (while using minimal reserves of fuel) it has been utterly superb. Will I miss it? Perhaps not during the summer months – I’m ready for something a little smaller and more exciting ­– but come those long winter days I suspect it’s crushing motorway cruising competence will be dearly missed.